The most important factors that Wollongong City Council looks for in the people that design their playgrounds are their ability to have fun, play, draw and be a kid. One of the 2014 recipients of NAPCAN’s National Play Your Part Award, Wollongong City Council – Child Friendly Cities, has undertaken their widest consultation with 270 children and young people to overhaul Wollongong’s Stuart Park playground, the largest in the region. Tracey Kirk-Downey from the Council’s children and family services department, consulted with students from Coniston and Wollongong public schools, the Smith Street Children’s Centre and the South Coast Workers Child Care Centre, to give them a voice in the design of the spaces they use. The children and young people from 0 to twelve years-of-age were asked what they liked and didn’t like about the playground, what sort of the play they liked such as swinging and sliding, how they interact with the green space and what equipment and activities they would like. They created design concept maps to incorporate casuarina trees to play in and equipment for children with disabilities. Up to 170 children and young people created artwork for the playground including a large mosaic dragon fly, as the insects are iconic to the area. They designed clay tiles and moulded play fossils to represent the indigenous extinct animals that lived there prehistorically. The fossils were then embedded in the dry creek bed that runs through playground. To reflect the modern history of the place the school-aged children created drawings of the migrant tent city that was there fifty years ago. Where migrants from Holland and Norway lived for months when they first arrived in the region. The children were shown archive photos and they created drawings of what life would have been like then, which were converted into clay tiles and installed into the footpaths in the playground. 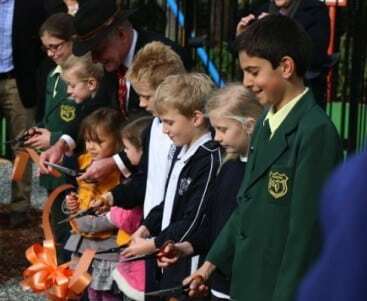 The official opening of the playground was two weeks ago, where 250 children attended, a few of the children were invited to cut the opening ribbon and to speak to the crowd about their contributions. The next two projects that council are engaging with children and young people on is the town centre revitalisation project and the library’s strategic plan. Tracey Kirk-Downey said that she’s very excited that other team’s from council are now running consultations with children and young people. Ms Kirk-Downey said that winning the Play Your Part National Award has led to other councils learning from the Child Friendly Cities initiative to adopt consultations with children and young people in their own area, including Campbelltown and the City of Sydney. The school-aged children created drawings of the migrant tent city that was in Stuart Park in 1949. Coniston public school students show their dragon fly drawings, which were made into clay tile artworks for the playground.